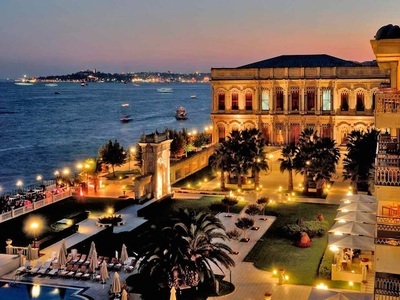 This Palace located in between Ortakoy and Besiktas in ıstanbul has rebuilt again and again and used different purposes; Firstly known ‘’Kazancıoglu Gates’’ reflecting the flowers and the love of music in 17th century, that palace was given by Sultan Ahmet III to his groom, vizier Ibrahim Pasha as a present. After that vizier Ibrahim pasha built that palace for the sake of his wife Fatma Sultan (daughter of Ahmet III) in 1979. Here many festivals named Cıragan Festıvals were organized. Therefore that placed was named Cıragan which means in Persian ‘’light’’. Secondly, Sultan Mahmud II decided to rebuild that field. Before the available mansion, then the school and the mosque in around of it were demolished at Sultan Mahmut II’s request. Despite of looking like as if it made of wood, completely stone was used in the basic of the structure. Also it reflected the classic style with 40 columns. 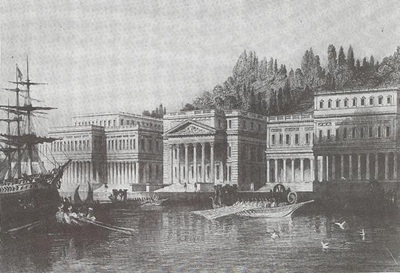 Thirdly, by demolishing the first palace built by Sultan Mahmut II, Sultan Abdulmecid decided to rebuild a new palace reflecting the western architecture in 1857.But the building of the palace couldn’t be completed due to both the financial problems and the death of Sultan in 1861. At last, following his brother Sultan Abdulaziz completed the building of the palace in 1871.But he preferred not the western style but the eastern architecture. The palace was designed by important architectures, Sarkis Balyan and his partner Narsisyan Kirkor by inspiring from the North Africa Islam Arthitecture. The construction took four years and cost four million gold pieces. 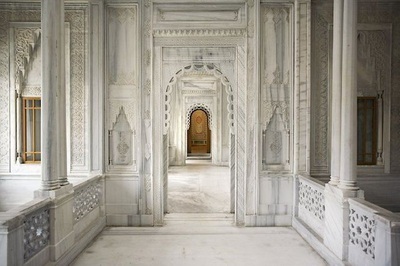 The ceilings and the interior sections were made from wood, the walls were covered with fascinating marble. The columns and doors were superior examples of the magnificent stonemasonry. Because of that when the German Emperor Kayzer Wilhelm II visited that palace, he admired the doors reflecting the magnificent stonemasonry. Therefore Sultan Abdulaziz gave it as a present to his close friend Kayzer Wilhelm II. Then, Wilhelm II gave it the Berlin Museum. This palace also used as the administrative management in 14 October 1909. 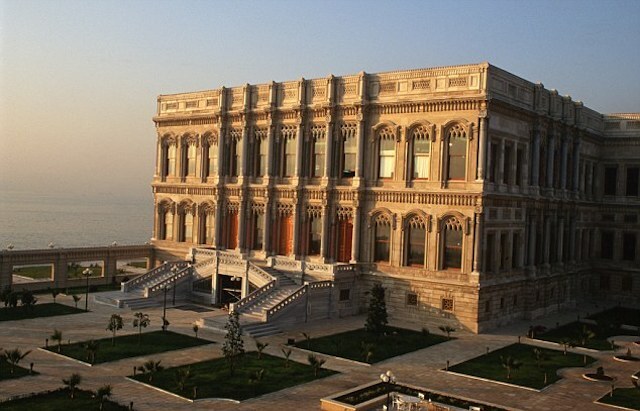 After being dethrowned, Abdülaziz and his family were imprisoned in this palace and were mysteriously found dead one morning.Then Sultan Murat V was also emprisoned in here for 29 years with his family after he was dethroned. Having being used as the Assembly Hall after the Declaration of Second Mesrutiyet [Constitutional Monarchy] in 1908, the Palace was burnt down in a fire due to the ignition of an electric circuit in January of 1910. 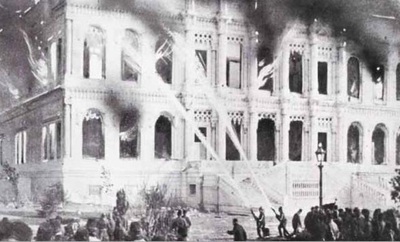 After its incineration, the empty field between the walls of Ciragan Palace was allocated to Besiktas Sports Club and was used as an honorary stadium for Besiktas. 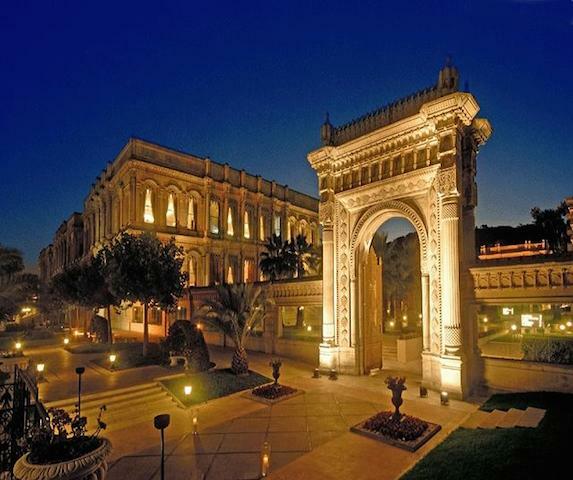 Towards the 1990s, the palace went through heavy restoration and is currently used as a luxury hotel called Ciragan Palace Kempinski.